4:00 Scratches/changes must be made Athletes should report to the line 15 minutes before each race. Like a heavyweight boxing match that ends with the favorite getting a TKO decision and wanting a rematch because they are not completely satisfied with the outcome. In Naperville North's case, they know they got ruffed up pretty good in the ring... and outfoxed by the girls of Yorkville in Minnesota. Conjecture aside- it's now time for round three. The Huskies won round one at the First to the Finish Invite and the Foxes took the Roy Griak Invite sweepstakes over the weekend. Don't forget about Downers Grove South. They were co-conspirators in both of those contests as well with split decisions against Yorkville. Naperville North has two front-runners in senior Alex Morris and sophomore Campbell Petersen. They are both expected to be upfront and place well inside the top 10. The main item in closing things out will be the pack of course. Freshman Lucy Westlake will be a key component of the 3-5 scoring pack to complement her low stick teammates. Yorkville has surely come down off of their sugar high by now and will be ready to capitalize and go for another big win. The nine-point difference was they have five front-runners who put things together at the right time in Minnesota. Sophomore Helena Kleronomos, junior Kailey Fox and senior Emily Eberhart got out among the top 25 in the deep field and avoided the trap of getting boxed in. There is less wasted energy when you can control a race like the Foxes did. They will need to do the same thing Wednesday night. The other nationally ranked team Downers Grove South actually beat Yorkville at FTTF by one point 92-93 for second overall. The Mustangs have traditionally been known as a strong pack running team without a true front-runner. Not this year. 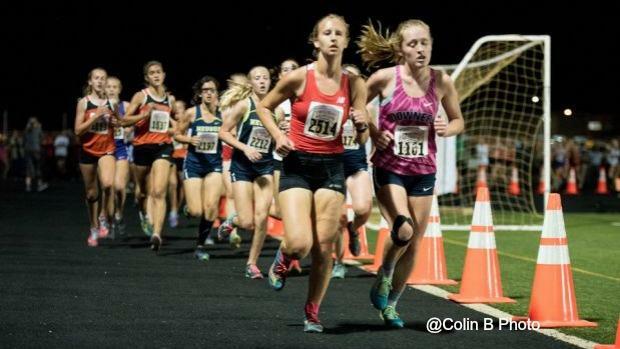 They have junior Brenna Cohoon who is guaranteed to finish among the top 10. She was 14th at Griak and that set the squad up to place 3rd ahead of some really stout competition. Senior Melissa Weidner and junior Erin Reidy have also grown into front-running roles when called upon. The race for supremacy will feel like an early state championship with 10 teams ranked (all of them in the top 20). Glenbard West is a squad that has made a living off of great individual talent over the years. But it appears now the Hilltoppers are relying on a total team effort in maximizing wins and great placements. We already know who the lowstick is, but rather keeping the focus on #2 runner senior Katie Hohe in setting the tone for the scorers. She has placed in the top five in each of her two major competitions thus far. The fact that she is pulling 3,4,5 along is important. Wheaton South will be competing in their second night meet. They recently traveled to Centerville, OH and placed 4th among the best teams in the Buckeye state. Sophomore Samantha Poglitsch is the Tiger's ace and she will carry her girls on her back. Batavia, Minooka, and Palatine are some more teams who are very strong. All three have a front-runner and complementary players to keep them in the contest. What about Katelynne Hart? It's hard to believe that the premier cross country entity in all of Illinois has barely been mentioned recently. The superstar junior from Glenbard West has been idle since September 15. We presume that she has been in the lab putting in quality training. Hart has raced just twice this season thus far, but don't get it twisted. She is the heavy favorite who will not take things for granted. The meet record was just missed by Hart who ran 16:15.9. The guess is she may go for it with fresh legs and mind. Mother Nature is expected to be a player in this affair Weds night. The weather will take a turn from the 50s and 60s to the 70s and possibly 80s. It is expected to feel like late summer for the entire day. High winds are also expected to bring in an element which could effect times and overall strategy.